My concern for the safety and future of wolves inspired me to make Run! It is now legal to kill wolves (and grizzly bears) in Alaska’s wildlife refuges. Thin legs have always been a fun challenge for me. I love four-legged animals and have developed several ways of achieving the illusion of thin legs: for horses (Sassy) I bunched the legs together into a column; for zebras (A Matter of Opinion) I made a low relief form on a high relief form; for the African wild dog (One For All) I made the extended leg a recessed high relief. For Run! I used what I call “creative webbing” to insure safe thin legs. Webbing is the stone left between small forms during the carving process to protect the thin, little forms from breaking during the carving process. Usually the webbing is carved away near the end of the creative process. I designed the snow forms to act as protective webbing for the legs, which are essentially in high relief, and strengthen the directional energy of the poses. The wolf in maximum anticipation of the stride has lots of round forms and the snow shapes echo the roundness. 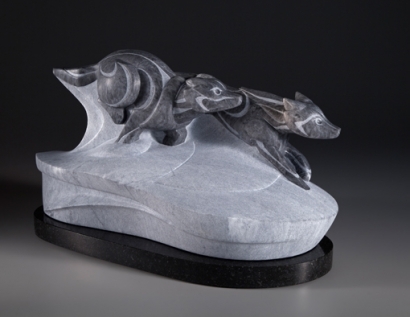 On the reverse of the sculpture the snow has long horizontal lines to strengthen the stretch pose of the second wolf. The stone is Ravina Azul Marble from Portugal. This is a new stone for me and was full of surprises. Very crumbly—I did not understand the reason at first. It fell apart while cutting with a blade, stripped the diamonds from my blade, and dulled my burrs. It wore out my rifflers and files in the finishing stages with little effect on the stone I wanted to remove. Hmmm. The reason was lots of tiny inclusions of something extraordinarily hard. Perhaps another block of Ravina Azul would have none of this. I hope this is true because the marble itself is beautiful to work and gorgeous to view. The finish required the exclusive use of diamond pads. While this does not sound tricky in words, it was very tricky in reality. Imagine not being able to use any file to refine the forms. Imagine a stone matrix mixed with something so hard it takes the diamonds off the small files. Think of small forms like legs and noses and ears that need to be refined and all you have is big sponge-like diamond sanding pads. I love a challenge. Mostly I love solving a problem and realizing my vision for a sculpture. Run! provides the ultimate satisfaction to date. I cut the diamond sanding pads into little, thin pieces that would fit into the small crevices to refine the small forms. This required a lot of squishing of my fingers and creation of finger-extending tools, but I made it work. As I sanded up through the increasingly finer grits of diamond pads I saw the colors and patterns emerge from the stone. There were more patterns and more shades of grey with successive grits. The stone itself was gorgeous! Were it not for the “titanium bits” in the stone it would be a wonderful carving experience. After sanding, I carefully added color enhancer to the wolves, masking off the snow forms. Then I carefully textured the snow to make it as light as possible. Dark wolves and light snow was most satisfying. However, since my files were completely useless in refining the edges of the forms of the wolves, I did not have as much definition to the forms as I wanted. Cuts were not deep enough and edges were not sharp enough. Here is the brilliant part—Inuit-inspired surface design. I needed to recognize these wolves as Alaskan. Inuit design is graphically bold, so I adapted the design shapes to work with and accentuate my wolf forms. Without that surface application they would not be seen as Alaskan wolves. It fits, and the vision becomes real. My mantra goes something like this: great color in stone comes at the expense of great energy. One must work for color. In the process, it is a challenge. In the end, it is a joy!